The Optimum Nutrition combination of taste and texture in our innovative Protein Stix format. It’s a Chocolate Bar Taste but a Protein Bar Nutrition. A Quick Hit of Protein has never been easier or more delicious. 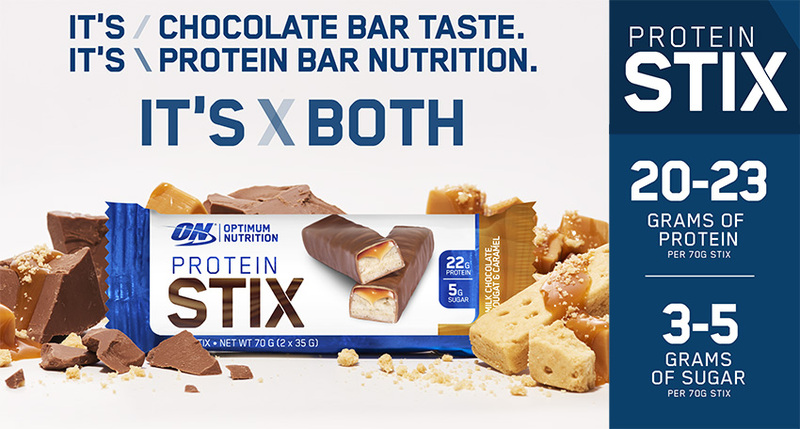 Optimum Nutrition Protein Stix – protein bars. Also Available at Suppkings Nutrition is the Optimum Nutrition Protein Cake Bite that is a Satisfying Whipped Cake packing 20g of High-quality protein. Plus the New Optimum Nutrition Protein Crunch Bars! my favourite bar at the moment their light in texture and delicious with your Morning Coffee.